This year the day right before Thanksgiving is National Tie One On Day; an opportunity for you to show your gratitude by sharing a little of what you have with someone in need of a thoughtful gesture. Give an apron (or wrap an apron around a homemade baked gift) and pass it along to someone in need as a way to give thanks this year. I absolutely love aprons and don’t need a special occasion to celebrate them! So, I’m taking this opportunity to share one of my favorite apron projects, the one yard “no-waste” apron. This quick and easy project has been around for generations, and makes full use of cutting all pattern pieces from just one yard of fabric. In fact, this is such a simple project that in the past it was often used as a first sewing project for beginners. 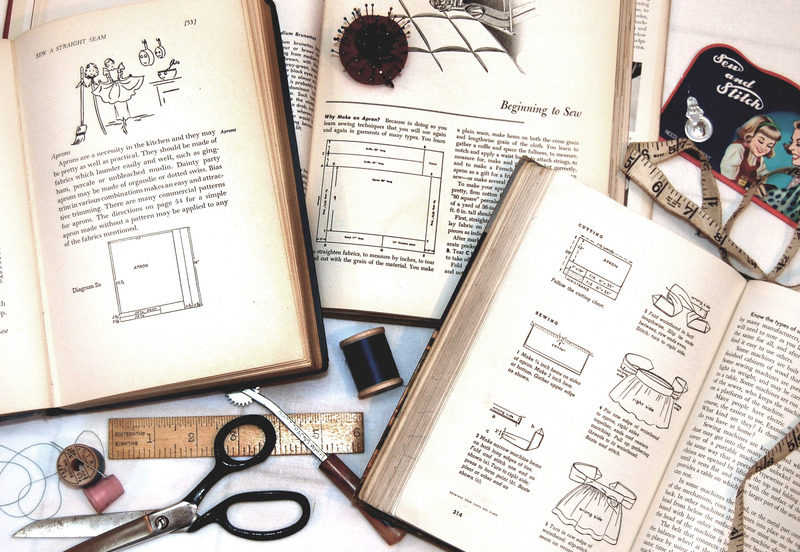 Check out these vintage text books from the 1940’s and 50’s, and you can see cutting charts for three different versions of the no-waste apron. Chances are your grandmother may have made (and worn) this very apron! 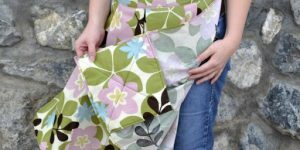 Here are a few of my favorite tutorials for updated versions of the one yard apron, still simple to make and great to wear. So what are you waiting for? Grab a yard of fabric and get ready to stitch up an apron! This updated version of the one yard apron from Lucy at My Byrd House includes a little ric-rac for a vintage touch. A great half-apron for working in the kitchen, and this would also make a wonderful gift for National Tie One On Day. Visit My Byrd House for the full One Yard Half Apron Tutorial. Ever found yourself wandering around the kitchen looking desperately for a pot holder to lift a hot lid off the pot on the stove? This apron will solve that problem with built-in hot pads! Find the Pleated Apron With Built In Hot Pads tutorial from The Mother Huddle, and never burn your hand on a pot lid again. I hope you enjoy the one yard apron as much as I do! And if you’re in the mood for some more apron inspiration, find even more apron tutorial goodies here and here! Next Next post: “Paint” Your Own Holiday Cards – with Your Embroidery Machine!